Who the heck is Bill Paxton? Cool. His next build should be Bill Pullman Pachinko. so, what happens when you lose? @blizzarddemon – turn in your geek card. now. I think it’s perfectly reasonable that someone born after 1990 might not know who Bill Paxton is. But, that’s sort of the best part about this machine. Hudson – Hey Vasquez, have you ever been mistaken for a man? Vasquez – No. Have you? That is pretty damn awesome. Although it looks like the angle of the table is a tad steep. The spring bumpers near the flippers barely move the ball. Either that or the ball is too heavy. Good job though! It’s unfortunate I didn’t know who Bill Paxton was before I saw this project years ago. It’s not unfortunate that I still don’t really know who he is after the project is completed. All I care about is the pinball machine itself. Fantastic build. Oh, the things I would do if I were as skilled as Ben. @yuppicide: Well, you don’t gain skills by sitting around and complaining about not having any skills. Get to it and start building something! It should have just been an uncle chet machine! with the jaba the hut looking thing on it. its funny, in australia, the name paxton tends to bring a certain family of social security bludgers to mind. not the aliens guy. C’mon Kids. The Hudson character is a cultural icon. Rigley: “This little girl survived with no weapons and no training”. Bill Paxton’s lines in many of the movies he’s been in are as memorable to some people as the script to Monty Python’s “Quest for the Holy Grail”. He’s never been the lead role in any of those movies, that I can think of, but he’s always been a very memorable supporting actor. 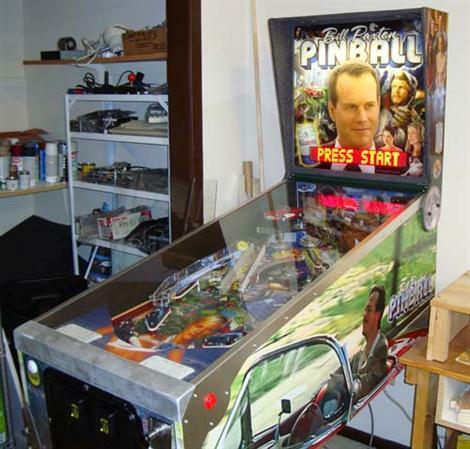 It’s a little surprising that someone would put so much time into a single pinball machine dedicated to Bill Paxton, but any movie lover in their late 20’s or older should get a real kick out of it. Being a budding fan of pinball machines, I wonder how this particular machine plays. Can we get a VPinMAME working copy of this? You could make one. It really wasn’t too bad if you weren’t adding custom scripted events.